Looking for a truly Dedicated PS4 Ark Cluster Server? Well, you're at the right place. 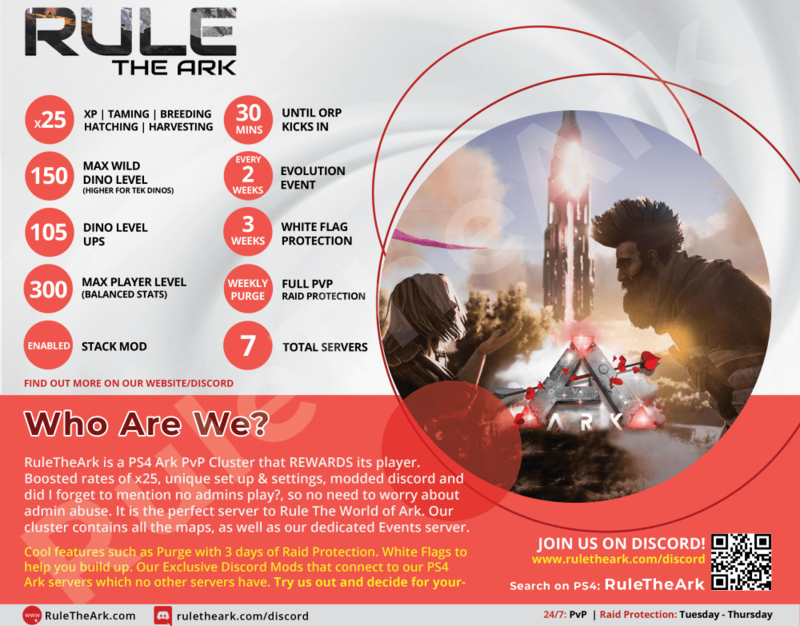 A server with truly boosted rates of x25 and no admin abuse, its the perfect server to Rule The World of Ark. RuleTheArk currently has 6 cluster maps containing the maps: The Island, The Center, Ragnarok & Aberration, as well as our dedicated Events Server. We will be expanding on demand. So what are you waiting for? Season 5 of RuleTheArk has just begun. Each season is 4 - 6 months long!. 3. Set Map to Ragnarok if you wish to Join our Ragnarok server. 4. Search For RuleTheArk in the Name Filter. You can also check the Add To Favourites to join the server quickly in the future! Note: You do not need to add anyone on PSN to be able to join the server. Simply follow the instructions above, but if you have any trouble, feel free to get in touch! We reward our players!. Track your hours and points straight via our discord. One of a kind set up. RTA is a server with boosted rates of x25 that is very well balanced and maintained. With a very structured set up it's one of the best arks out there, but I'll leave that decision up to you. Detailed info can be found via website/discord. Our community is heavily driven by its players, so no suggestions go unnoticed. So what are you waiting for?. Check them out and decide for yourself. All details can be found on the website, and don't forget to join discord.